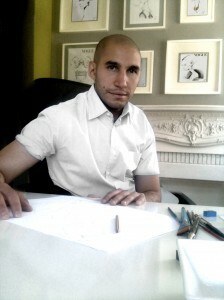 Fashion and Beauty illustrator Nuno Da Costa is one of our judging panel. We are delighted to have him on board for the final leg of the Diversity NOW! national competition for students. For All Walks Nuno created a special illustration to celebrate our call for Diversity…the result is a much more curvaceous body than he would normally be asked to draw. Co-founder Caryn Franklin, caught up with him to talk more about the process. AW: Thanks Nuno for agreeing to be part of the judging panel. We love the illustration you have created because it tells a story of a beautiful aspirational body. She is fashion, she is current and she is projecting a much more achievable body ideal – what’s not to like? We have just put out a call to our students to consider their fashion illustrations and how these drawings, at the very start of the design process might, if they are too elongated (as many are) influence the design outcome in an unrealistic way. The cartoon, emaciated physique is so often prioritised in fashion by illustrators that it has become normalised. Illustrators have a lot of power to change our perceptions of beauty after all. Tell us how you approached this drawing. “The challenge was maintaining that awareness and recalibrating my own beauty ideals, assessing what I find aesthetically pleasing and why I find it so. Is it because I really do find something attractive or because I have been conditioned to find something attractive? Thinking this was challenging but incredibly rewarding. “No, not at all. Clothes can look beautiful on any body type as long as it’s healthy. For me personally, it’s all about the clothes being worn with conviction and with the right attitude. I recently bought every issue of Vogue America from 1972 till the present day and it’s really interesting to see how the representation of the ideal body changes from super skinny in the 70′s to womanly, strong and athletic in the 80′s/ early 90′s and then back to skinny with the ascension of Kate Moss. Maybe after the excesses of the 80′s there was felt a need to strip back and minimise and Kate was the embodiment of that. I don’t think it was because the clothes looked any better on the skinny body than they did on the fuller, more womanly figure, they just looked different, and like all things this is cyclical. Nuno will join Designer William Tempest, Couturier Deborah Milner, DisneyRollerGirl Blogger and freelance fashion editor Navaz Batliwalla, Brand Consultant Jason Jules, Body Image commentator Stephanie Heart, Film Maker Kathryn Ferguson and Photographer Kayt Jones along with key members of the i-D editorial team to judge the final entries announced shortly. The winning entries form each category and the overall winner will be announced at Graduate Fashion Week in June. 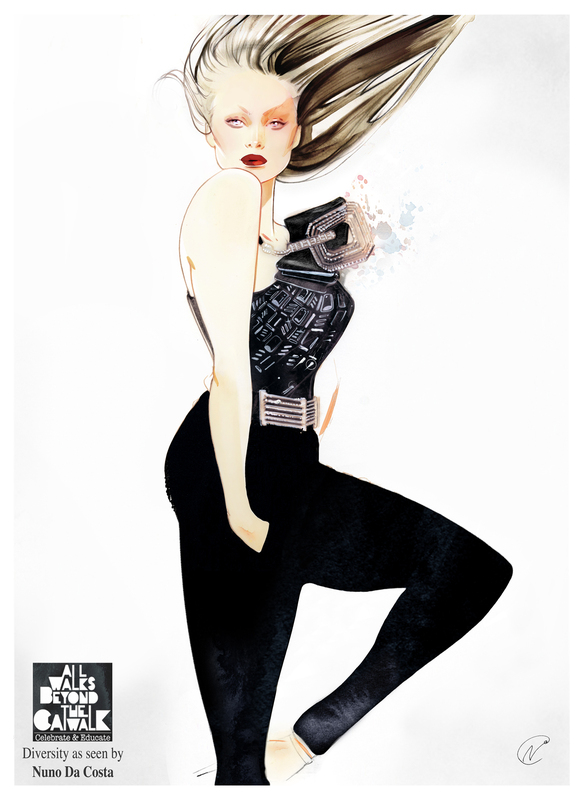 Nuno is a self taught Illustrator specialising in Fashion and Beauty imagery. Represented by top British Illustration agency Illustration Ltd (www.illustrationweb.com/nunodacosta), in the UK, US, China and India and represented by sister agencies in Germany and France. After leaving Kings College University where he studied modern languages and Latin American and Hispanic Cultural Studies, Nuno decided to change direction and pursue his love of all things Art and Fashion. He put together his portfolio and within a week started working for various publications at Emap and Hearst publishing houses both in the UK and US. He was later discovered by leading fashion hair stylist Neil Moodie who asked him to collaborate on an innovative eight page spread for Wonderland Magazine along with world renowned make up artist Lisa Butler, a seminal event which has shaped and coloured Nuno’s approach and technique to this day. In 2010 he achieved his longstanding dream of being published in British Vogue in their Christmas special ‘Superstar Issue’ which has lead to collaborations with The Telegraph, Christian Dior, Vogue Portugal, The Sunday Times, L’Oreal Professionnel and Clinique amongst many other well known and respected names in the Fashion, Beauty and publishing industries.